Berwick Rangers player-manager Colin Cameron has been sacked, just an hour after his team lost 4-1 away to Montrose. The former Scotland international, 43, played for an hour of the game at Links Park, but was dismissed after a defeat which leaves Berwick seventh in League Two. 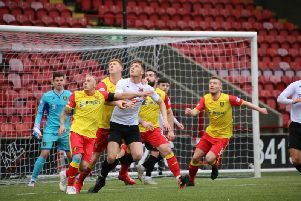 Cameron’s men have only won only one of their past seven games and crashed out of the Scottish Cup in a 4-1 defeat at Annan Athletic last weekend. A board meeting is now planned for Tuesday after which the club plans to release a statement. Cameron has been in charge at Shielfield Park since January 2014, when he replaced Ian Little.